This is a very distinctive sword-type which by its incidence in works of art can be given a more than usually precise life-span between c.1275-1340. Its characteristics are a short grip and comparatively short blade which is broad at the hilt and tapers strongly to a sometimes very acute point with a generally flat section fullered in its upper half. Cross tend to be generally quite long and slightly arched, while the pommel-type most commonly found allied to the to these other elements is of Type K, broad and flat with small raised bosses. Naturally, like all swords, their sizes vary; and we do not have very much hard archaeological evidence to go on, for, in spite of the type’s obvious popularity in the period of its usage, very few examples are so far available for study. Not so their appearance in works of art – sculpture, tomb-effigies, MS miniatures and early Italian paintings. When they are depicted in their scabbards, it is not possible to be certain that they are not of Type XV (q.v below) nut enough are shown naked to make dating secure. They appear only once or twice along with the more usual Type XII’s in the Maciejowski Bible (c.1260) as well as in the Oxford Romance of Alexander, an earlier English MS dated c.1333, where XIV’s are shown along with XIIIa’s, XII’s and XV’s. Condition: Excavated, probably from a bog. Poor, very corroded. Interesting double fuller. Condition: Perfect. Must have been preserved in a house or an armour or well-cared for. The grip is probably an original. This is one of those perfectly preserved, sharp and shining medieval swords which are too easily condemned as being ‘too good to be true’. Considering that it was acquired about thirty years ago by a collector and connoisseur as astute and experienced as Mr. Christensen, there can’t be much validity in any doubts about its authenticity. It’s a big sword, as you can see from the dimensions upon the elaborate series of drawing [sic] Mr. Christensen sent me just after he had acquired the sword. In the catalogue of his collection made before it went on his death to the Danish nation, he dates it at c.1475. (‘Gammelt Jern’, No.66, p.88), but I believe this is nearly two centuries too late. [sic] its whole form – pommel, cross and blade – are so strongly fitted into the classic XIV shape tha I am sure it has to be dated between c.1275-1325. It is an absolutely outstanding sword, and I think the sketches he sent me give a very clear idea of its size, and the rather unusual form of its long, beautifully made double fullers. Unfortunately, the only photographs I have are not very good. This is one of the most difficult sword-types to identify, because so many swords which might seem (perhaps by the forms of their hilts) to be of the type are in fact Xs, or even XVIs. In isolating the type, I laid down two totally arbitrary criteria: (1) that the blade should have noticeable taper, and an acute point, and the grip should be quite short, never of hand-and-a-half length, and (2) that the fuller should not extend beyond two-thirds of the length of the blade. This is all very well where these features are obvious; identification is easy enough as the illustrations below will show, but there are so many examples where the fuller is nearly(or quite) three-quarter length, making it nearly an X, or where there is no, as in No. XII. 16 below, or where the hilt is of a clearly early form, as in XII. 2 below, or where the taper is very slight and the point rounded, or when the grip is longer than the ‘standard’ 4″ to 4&1/2″ single-hand length. So many swords have one or other, or even all, of these difficult characteristics that one has difficulty in pinning them down to any of the types. I mentioned the ‘early form’ of the hilt of XII.2. I must reiterate my firm belief that you cannot date a sword by its type, for most of the types – not all, as you will see – can span the whole of the medieval period. Nor can you use the forms of cross and pommel to date a sword – hardly ever. 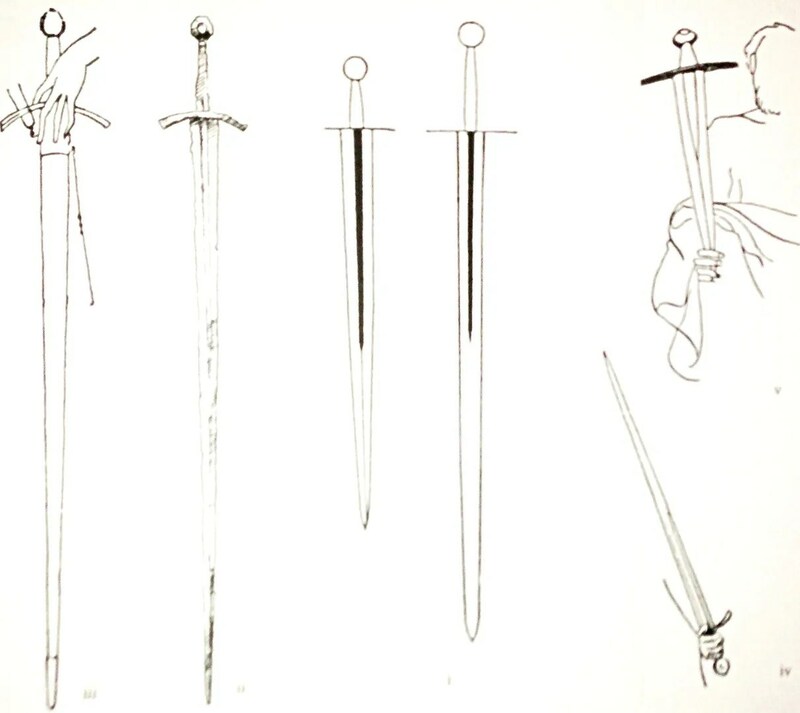 There are a few, mostly in use in the 15th century, which are dateable to a few decades, and can be identified with a region; but most of the pommel-types and cross-styles span the whole period; besides, within those types and styles there must be an infinity of variation – personal, regional and in some cases plain careless on the part of the cutler who made them. A sword’s cross is a most difficult object to make by forging, and distortion is difficult to avoid. Condition: Excavated, but good except for a very pitted surface. Condition: River-found, very good. Considerable pitting, especially the last 15″ or so towards the point. Considering this sword’s find-place, in the Great Ouse about four miles away to the south of Ely, it could be tempting to think of it as a relic of the fighting around Ely in 1070 when the Conqueror finally took teh Isle by crossing the Marsh over causeway from Stuntney, one-and-a-half miles to the east of the city; but as far as is known it is unlikely that any knight of that army would have been four miles off across the swampy fen to lose his sword at the point, where it was found. It is much more probably one of the (so far, in 1988) seven swords from this river, in a twelve or so mile stretch between Southery to the north of Ely and Upware to the south which )vary in date from c.950-1400) were thrown in deliberately as ‘sacrifices’. It is very difficult ot date this rather important sword; its blade is almost, if not quite of Xa form, yet I have categorised it as a XII because of it [sic] rather long grip. Taking only the form of blade and cross, one would date it, via Leppaaho’s finds, at c.1100, yet the form of the pommel is generally between c.1260 and 1320. Therefore it can only be suggested that it could be dated, because we don’t yet know of a reliably dated example of the pommel form as early as 1100, to a period of usage somewhere between 1250 and 1350. Condition: good. This was found with two other swords in a a house being demolished in an Italian town. The swords were hidden between two walls, so had been preserved in dry conditions. The gilt-bronze pommel and cross have been severely cleaned, but are in very good condition, the iron under the gilding not having corroded at all. The blade and tang are covered in a rather thick brown patina – though to call it a patina when it is more in the nature of the thick brown deposit is perhaps too polite to it. Beneath this crust, however, the blade seems to be perfectly preserved. 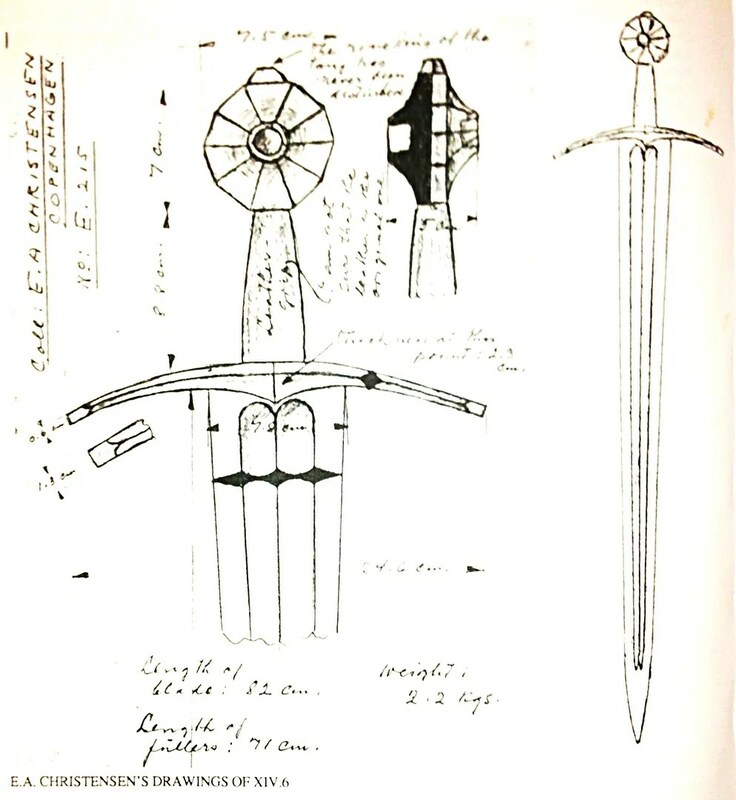 It is difficult to to categories this sword with certainty, for there is no clearly defined fuller in the blade, and its grip is is rather long for a Type XII, thw whole thing being in the proportions of a Type XIII. Compare it, for instance with the No. XIII. 1 in this sequence. However the taper of the blade and the acuteness of the point is more in the nature of a XII, so I have put it under that type. It is a good example of one of the many cases where it seems quite impossible to put certain swords into a typological straight-jacket. The cross is unusual, too, rather heavy, made (like the pommel) of bronze gilded. It has been bent, and though it shows a strong transverse ridge along the middle of both arms on the ‘outside’, on the reverse it is quite plain and flat. 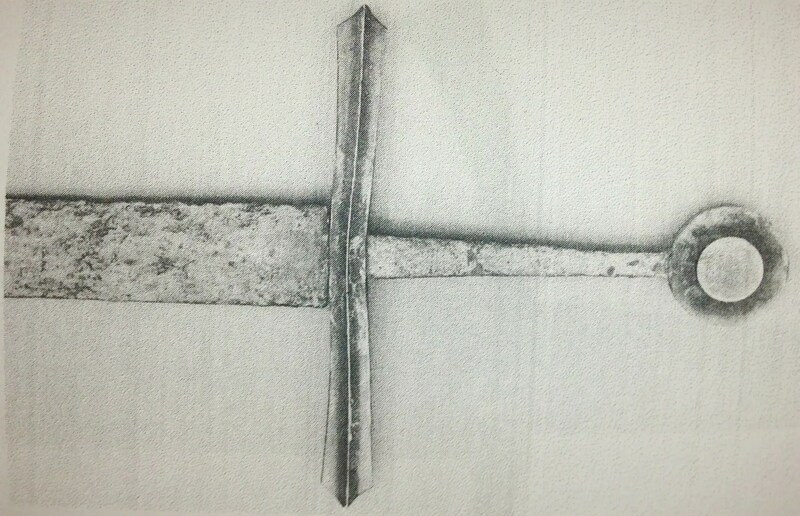 This feautre of half-decorated cross is very common, particularly in 15th century hilts. This type is distinguished by having a sledner blade, generally long in proportion to the hilt, with a very narrow fuller running to within a few inches of the point. In classic examples there is a very little taper to the edges, though in well-preserved examples the point is quit acute. 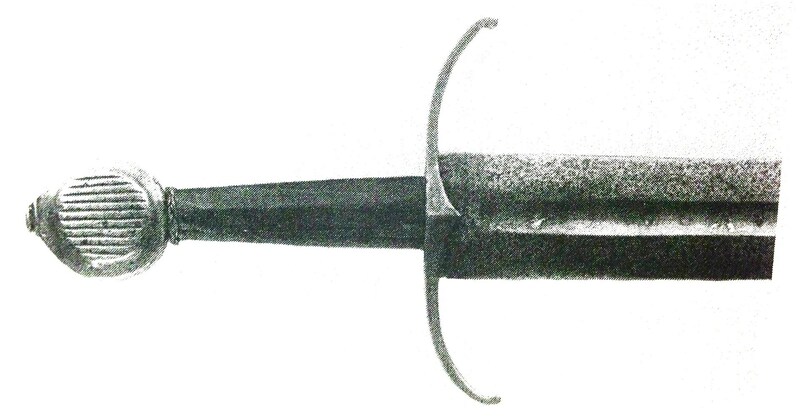 However, since so many river-found and earth-found swords have much heavy corrosion at the point, in such survivors the point appears to be spatulate and rounded. In my Sword in the Age of Chivalry I mistakenly added a Type XIb, thinking erroneously that such corroded blade constituted a sub-type. There is, however, a positive sub-type in XIa, where the blade is broad, but the fuller remains very narrow. Examples of these are rare, one of the best being shown here at XIa.1. As with all of the other types, the form of pommel and styles of cross varies a good deal within the limits of custom and availability during the period of usage – which in the case of Type XI seems to be between c.1100-1175. This statement however, needs to be accepted only with caution. We don’t know what hiterto unknown survivor may rise from earth or river or tomb with a reliable dating context to confound my typology. Or from somebody’s collection, for that matter. So far as I know at present, XI’s have inscription either in iron (as in XI.1 here) or in silver or latten or gold where the ‘handwriting’ matches Leppaaho’s 11th and early 12thc century Viking blades. The beautiful Xa, in the Wallace Collection (No Xa. 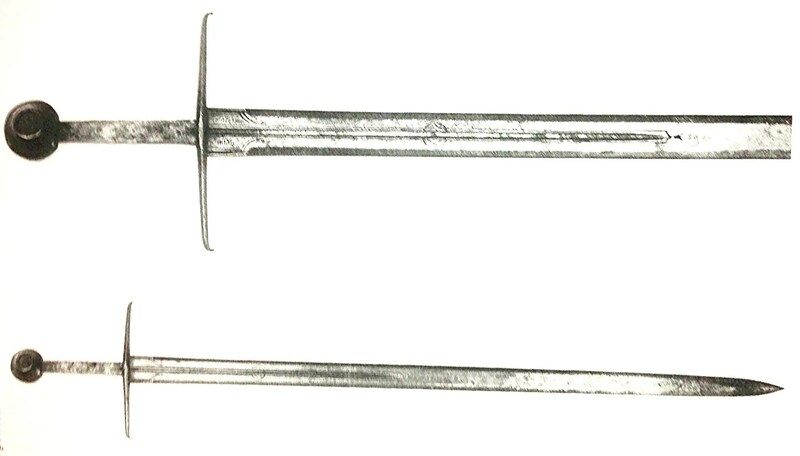 1 in this series, above) is a perfect example where, having only the form of the sword (not its perfect preservation) to go by, it cannot be pin-pointed at all to any certain period between 1050 and 1350. All that can be said is that it is a classic Xa, whose hilt is matched exactly by (a) some of Leppaaho’s Viking hilts and (b) hilts shown in monumental art between c.1250 and 1350. So it may be with Type XI, though at present (October 1990) I would not date any XI beyond c.1125. Iron inlaid inscription NISMOMEFECIT on one side and a garbled version, not very clear, of INNOMINEDOMINI on the other. Publications: XI. 1. An article in the The Ancestor in 1903; VIctoria and ALbert Museum, THe Art of the Armourer, 1953; XI.2 Leppaaho, pl.5. This beautiful sword has been published and illustrated several times; the first I know of was in a very select and aristocratic magazine, The Ancestor, in 1903. Laking featured it in his Record of the European Armour and Arms…in 1921, and it appeared again in the catalogue of the sale at Christies in 1921 aof the Morgan Williams collection from St Donat’s Castle. Iwas exhibited in the Victoria and Albert Museum in ‘Art of the Armourer’ exhibition; however, for some reason in none of the these publication was any mention made of the nature of the inscription. 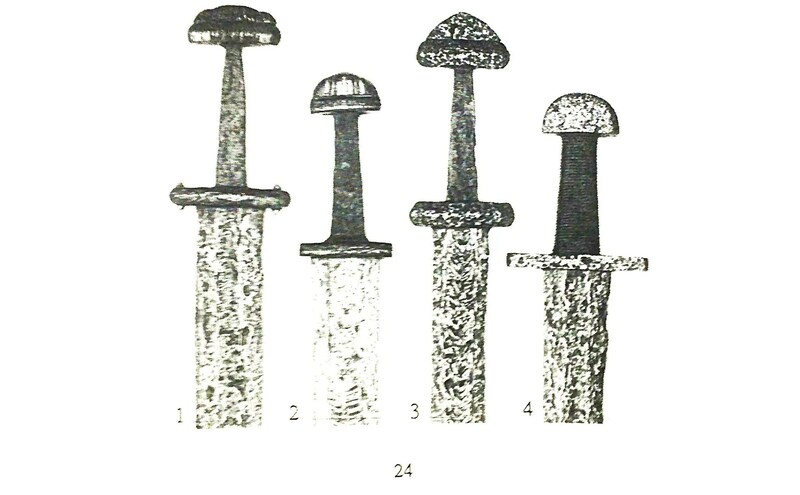 There are two other swors inscribed NISOMECECIT, one in the Museum at Stade, the other in Helsinki – illustrated in Leppaaho, Fig. 5.2. This is a aperfect example of the type, with its long blade and narrow fuller. Condition: Excavated. Poor. A great deal of corrosion and deep pitting on the blade, and the hilt as well. The cross has one arm nearly taken off by a avery deep piece of corrosion. Collection: Ex. D’Acre Edward coll. Royal Armouries. Condition: Excavated. Quite good. Surfaces of balde good except for the last 10″ (25cms) or so near the point, where it is very heavily corroded. The pommel and cross are well preserved. The grip is modern. There is a tiny inscription in the balde on one side, the letters SOS. It has been suggested that this unlikely-looking combination of letters is in fact the initial letters of the words SANCTA\, O SANCTA.